porting wastegate - Miata Turbo Forum - Boost cars, acquire cats. hi I am a noob, having only installed the turbo a couple of weeks ago. I have bad boost creep and need to port my wastegate. As you can see in the picture I painted the flapper blue and closed it over the hole to see where it landed. Now when I go to port it I won't be able to cut a circle, because the flapper is so close on one side of the hole. Is there going to be any ill effects if I cut straight into the fat side and radius the end? I have my boost cutoff set at 170kpa. I can hit that with the wastegate wired open. Hooked up anywhere from 5200-6000 rpms. The hole is now 22.6mm any shots in the dark how much larger you would make it? I've been told 23mm, but that doesn't seem like much, but hell, I don't know. I look forward to your opinions. Make it as big as you can while still being able to seat/seal. Making a groove/path to the hole is just as important, don't miss that step. The most important step is carving the "path" to the wastegate hole itself (not necessarily making the hole bigger, although yours looks very small). Erat's example in that thread is really good. To be specific, I would enlarge it how posted below, and try to radius the inlet. Not sure about a channel, but a radius going to the wastegate will help flow. Last edited by patsmx5; 03-27-2017 at 02:54 PM. For everyone getting their kits and doing their porting, I've been asked a few times how I did mine. I looked back and it looks like I was inconsiderate and didn't take pictures of the completed port job. However, the picture below shows everything you need to know about my port job. I put chalk on the flapper and closed it a few times to leave a chalk outline of the flapper. I outlined that with sharpie, then set to work. Sharpie line is where the outline of the flapper. Red line is approximately where I cut out. The only thing I did was enlarge the hole, leaving about a 2mm rim all the way around to make a good seal with the flapper. I took measurements before and after, and this added about 30% to the area. Airflow is proportional to the area of the hole, so this allows 30% more airflow. The whole thing took 1 hour including taking apart the turbo, measuring, cutting, cleaning, and putting it back together. The result is that when the wastegate is wired open, I get no positive boost (less vacuum than full vacuum, but less than 100kpa) all the way to redline. With the wastegate in action, no boost creep. Also, for the record, I did no channeling, which IMHO is for people who don't understand physics. This is what NigelT has posted up and I have had several people follow. 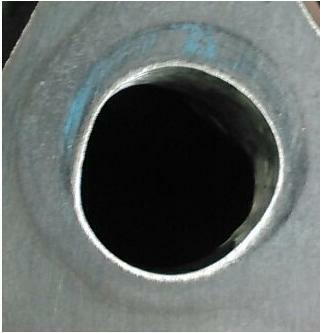 We have found enlarging the hole has far more of an effect then adding the groove. I disagree. Or at least I'd say it might be different from turbo to turbo depending on size of the hotside. On my 3076r, I gaped the hole literally as big as it can be and still seal by the flapper, and still had 2-3psi creep until the groove was added. I will grant you it is probably different turbo to turbo. I know OP has one of my turbo setups. When I first ported one of the cheap t3's I did just the groove and was still getting creep. I ended up enlarging the hole and that fixed the issue. Several customers of mine have done either way and for whatever reason on these cheap t3's it is enlarging the hole that gets rid of the creep. SonofThehill has ported a few now and I believe he only enlarges the hole. I really don't think there is a difinitiv answer here. There is quite a bit of variation between different turbine housings​. I think you can get away with just opening the hole but it makes tooning CL EBC trickier. With these virgin Chinese T3's anyway. I personally want to get another large turbo and not port the thing. Since I want more boost up top, I don't think creep is such a bad thing. I even considered trying to weld a bead around the inside of my port to close it a bit, just for a moment. Shoot me an email. I might have a spare housing or two that have not been ported yet I could trade with you. Ported the wastegate hole. I came out with an oval measuring 25.5mmx24mm. The original was 22.6mm round. It worked and I have boost up to redline with no more creep issues. Yesterday, when I took my car to redline, under boost, I did it kind of slowly. I had no issues. Today I decided to really push it when coming off a red light. WOT from clutch release on. I hit my boost limiter at 6500 rpms in third gear. I have limit set at 10 psi. So I guess I'm still having some boost creep and I need to remove a little more material from the hole. My fat *** arms are sore and bruised from jamming them in and under the manifold. I'm going to have to wait until they heal up before going at it again. I would work on porting a channel a bit to help air flow towards the enlarged hole. I can open a small area up, which I'll do. I'll finish up by channeling all the thinner areas of the casting. It'll be a little while though. I need to get back to my running warm issues. It's ac weather. My car doesn't like to run cool with the ac on. I hate to ramble but I tightened the wastegate actuator a couple turns. It seemed to move the boost cutoff close or at redline. I'm going to do some datalogging and tuning today, so I'll know for sure if it indeed did hold the boost creep back. Going to give virtual dyno a log to see what kind of numbers it gives me. I had been putting this off. No matter how I adjusted anything I hit boost cutoff at 6100 rpms. Today I raised my boost cutoff from 170kpa to 180kpa. I did a couple pulls in 3rd, 4th & 5th gears, to redline (7200 rpms) without any fuel cutout. I guess that little bit of leeway is all that it needed. Time will tell but I'm speculating that I don't have to port anymore. Can't believe I waited so long! Higher boost cut is definitely an effective way to solve problems with hitting boost cut. Glad it's finally got a full powerband again. Looks like your getting things worked out! You will have a well sorted car soon enough. CX Racing 1.6 Turbo Kit - Worth it?